"Peritonitis is the most common clinical manifestation of abdominal TB. Infection of the peritoneum is usually secondary to hematogenous spread from a pulmonary focus, from adjacent organs such as the intestine or the fallopian tube or ruptured necrotic lymph node. Liver cirrhosis, human immunodeficiency virus–positive, and chronic renal failure patients on continuous ambulatory peritoneal dialysis are at an increased risk for peritoneal TB." Rout, Abhijit A. et al. "Based on the pattern of ascites, omental and peritoneal tubercles, and associated inflammatory and fibrotic response, TB peritonitis has been traditionally classified into 3 categories." Raut, Abhijit A. et al. "Wet ascitic type-This is the most common variety of peritoneal TB seen among 90% of the cases with significant free or loculated high-density ascitic fluid on CT scan.". "Fibrotic fixed type-This relatively less frequent variety of peritoneal TB is characterized by mesenteric and omental thickening, tuberculous deposits, and matted bowel loops.". "Dry or 'plastic' type-his is a rare variety showing peritoneal nodules, fibrous peritoneal reaction, and dense adhesions. Ultrasonography can accurately demonstrate small quantities of loculated or free ascitic fluid. Multiple thin, complete or incomplete septae can be seen with echogenic debris being frequent in the loculated ascites. However, these features are can also be seen in malignancy, chronic infective peritonitis, and hemoperitoneum. CT scan shows loculated or free, high attenuation ascitic fluid (20–45 Hounsfield unites [HU]), omental thickening/nodularity, and thickened inflamed mesentery associated with mesenteric adenopathy." "The common routes of spread of tubercle bacilli to the gastrointestinal tract (GIT) include hematogeneous spread from the primary lung lesion, ingestion of infected sputum from active pulmonary focus, direct spread from adjacent organs, or through lymphatic spread from infected lymph nodes. Although TB can involve any part of the GIT, the most common target site of involvement is the IC region. This is likely owing to several factors, including relative stasis, abundant lymphoid tissue, and closer contact of the bacilli with the mucosa in this region." "The IC region is the most frequent site for bowel TB. The frequency of bowel involvement decreases both proximally and distally from the IC region. Multiple strictures, adhesions, and bowel obstruction are the most the most common complications. Perforation followed by fistulae formation and intestinal bleeding may be seen but are uncommon." "CT scan is the modality of choice for the evaluation of abdominal TB. Mural thickening of the IC region is frequent in GIT TB. It may be limited to the terminal ileum or caecum, or it may involve both .The thickening may be symmetric or asymmetric. Asymmetric thickening of the IC valve and medial wall of the caecum may have an exophytic extension and this may engulf the terminal ileum. Fat stranding and inflammation is seen in the pericecal region and adjacent mesentery. There may be associated bowel obstruction and/or perforation." "Hepatosplenic TB occurs secondary to hematogeneous spread of disease from active tuberculous focus elsewhere in the body. Commonly, it presents as miliary form in association with miliary pulmonary TB. Miliary TB manifests as hepatomegaly with multiple tiny low-attenuation foci without significant postcontrast enhancement on CT scan. The macronodular form of hepatosplenic TB is uncommon and manifests as a few hypodense lesions with ill-defined margins." 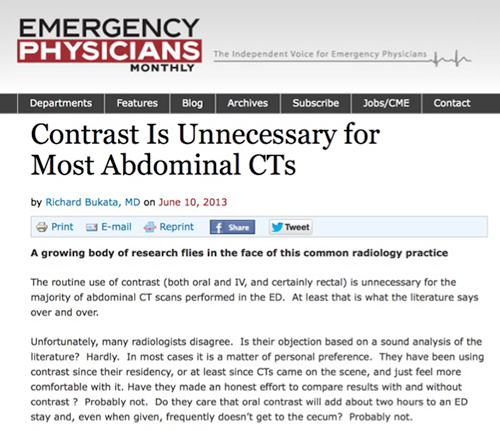 The routine use of contrast (both oral and IV, and certainly rectal) is unnecessary for the majority of abdominal CT scans performed in the ED. At least that is what the literature says over and over. Unfortunately, many radiologists disagree. Is their objection based on a sound analysis of the literature? Hardly. In most cases it is a matter of personal preference. They have been using contrast since their residency, or at least since CTs came on the scene, and just feel more comfortable with it. Have they made an honest effort to compare results with and without contrast ? Probably not. Do they care that oral contrast will add about two hours to an ED stay and, even when given, frequently doesn’t get to the cecum? Probably not. Acute abdomen: Added diagnostic value of coronal reformations with 64-slice multidetector row computed tomography.